A year ago today I wrote this post. Two months later, an eight year relationship was over. To this day I’m not entirely sure why. I still miss her, but life goes on. To those who have been fortunate enough to find a lasting love, all I can say is do everything in your power to keep it fresh and alive. I honestly believe that the biggest reason relationships sour is not abuse or infidelity, but rather from two people simply taking each other for granted. While I realize that many will be posting something special for Valentine’s Day, I have even more reason than most for acknowledging this day: it was the day I proposed to my wife. It was six years ago today that my beautiful wife Leslie allowed her optimism to override her common sense and agreed to be my wife. And so it is on this, my first Valentine’s Day as a blogger, that I wanted to share our story. Others have found it rather romantic, and also rather improbable, and yet I swear before Heaven that every word I’m about to write is true. She and I first met in high school. She was a freshman, I a junior. I had for the past two years been friends with her sister, Kim, who was in my year. It was the end of the first day of school, September 1978, and Kim wanted to introduce me to her little sister, Leslie. To this day I can still remember the first time I saw her. She was sitting at a table in the cafeteria, a little wisp of a girl with chestnut hair, very big blue eyes, and a shy smile that reminded me, for some reason, of a kitten. I was instantly attracted to her, and she, in her own shy way, seemed to like me. In those days we all hung around in the cafeteria after school, because we all came from opposite ends of a big city, and this was the most convenient way to socialize. It should be mentioned that the cafeteria was a “modern” one, so that rather than sitting at long lunch benches, all the tables sat four people, which facilitated social contact. Almost from the beginning, Leslie and I gravitated to each other, and we started having lunch together during the school day. It wasn’t long before I summoned up the courage to ask her out. She said yes, but also said she would have to ask her father. It’s funny how decisions made by others on seemingly inconsequential matters can so materially change the lives of others. Her father was, to put it mildly, a gentleman of the old school, and there was no way he was going to have his youngest daughter dating an upper classman. It seems so silly now, it seemed silly then, but to him this was a big deal, and no amount of cajoling on Leslie’s part could make him change his mind. Leslie was, in the quaint parlance of the day, a “nice girl”, and not one to openly defy her father (this was back in the day when teenagers still occasionally obeyed their parents.) But teenage rebellion can take many forms, and so it was with us. We started having lunch together every day. And as we sat there, talking about whatever it was we talked about in our exuberant youthfulness, somehow our hands always seemed to find each other. It wasn’t as if we planned it, or even talked about it. It was almost furtive, the way our hands always seemed to meet, at first making seemingly incidental contact. On one day it might have been a finger brushing a finger, on another a friendly pat on the forearm, but somehow it always ended up with us holding hands as we sat together at a cafeteria table. Lunchtime became the high point of both our days. For forty minutes every day, she was my girlfriend. But of course, this couldn’t last forever. Leslie tried on more than one occasion to change her father’s mind, but his answer was always an unyielding no. Eventually we both came to realize that this was never going to happen. We both ended up dating other people, but even then we never fell out of the habit of eating lunch together. Sometimes we even still held hands. We fell out of touch after I went to college. I eventually heard she had moved north of the city, while I stayed more or less in the area, and spent twelve years in an unhappy, loveless marriage, which eventually ended in divorce. This was easily the low point in my life. All alone for the first time in twelve years, I tried dating, but found it a frustrating and miserable experience. Of course, I wasn’t exactly a little ray of sunshine at that time either, so I’m sure the women I dated found me rather depressing company. But whatever the reason, the dating thing just wasn’t working, and I eventually came to the conclusion that I really didn’t want a girlfriend anyway. Have you ever had a dream that was so vivid and powerful that you never forget it? Like most people, I forget most of my dreams as soon as I’m awake, and yet every so often I have one that stays with me for the rest of my life. These dreams are different, more powerful, so real that when I awake I almost feel physically different, as if I’ve just returned from a journey. One night, having not seen or even thought about her for years, I had such a dream about Leslie. 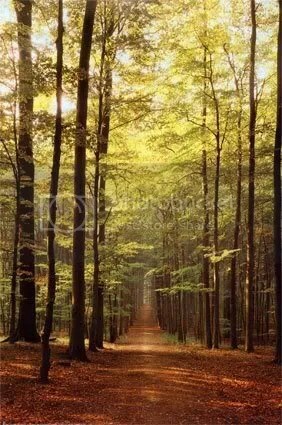 I dreamed that I was walking down a forest path. I saw someone walking up the path towards me. With a thrill that I could physically feel, I recognized Leslie, and she recognized me. We walked towards each other a little faster, and when we met she hugged me tight. Even though it was a dream, I can still feel the warmth of that hug to this day. We never said a word to each other, but simply held hands, and walked down the path together. It had been so long since I had felt happy that I had forgotten what it felt like. At that moment, for the first time in years, I felt truly happy. And then I woke up. For a second or two I continued to bask in the glow of that happy feeling, but then, with a letdown that felt like a punch to the gut, I realized that it had been only a dream. Even though it had only been a dream, it had been so real, felt so real, that I felt like I had really lost something. I was in a miserable mood for days after that. One week later, to the day, I had to appear in court to wrap up my divorce. There, I bumped into her brother, whom I hadn’t seen in years. In high school he had never been a particular crony of mine, but we had always been on good terms. We made small talk for a few minutes, and then I asked him how Leslie was doing. To my astonishment, it turned out she was back in town, having herself just concluded a divorce. He gladly gave me her phone number and suggested I call her. I couldn’t believe how, just for once, something seemed to be going my way. I had never thought to see her again, and yet if I could have chosen one person from my past that I could have wished back into my life, I would have chosen her without a moment’s hesitation. And here she was, by some miracle, a mere telephone call away. But what if it didn’t work out? Twenty years is a long time. I had certainly changed, and not necessarily for the better. I was older, fatter, and far more morose. She, too, might have changed. Maybe it was best to leave the past alone, to preserve the memory of who she had once been, rather than find out to my dismay that time had been as unkind to her as it had been to me. I almost threw the number away, but the memory of that dream was so powerful that it created in me an overwhelming desire to see her again, even if it was only once. So I called. “Hi, Leslie, it’s me, Stephen”. We must have chatted for about an hour on the phone. I asked her out to dinner, and this time there was no one to tell her she couldn’t go. We sat over dinner, chatting away as if no time had passed at all. And suddenly I realized that, without even noticing how it happened, we were holding hands again. This is my Valentine’s Day gift to her. She is my best friend, soul mate, and life companion. I can honestly say that I love her more than I have ever loved another human being in my entire life. My dream was prophetic. Was it a coincidence that I should dream about her one week before she came back into my life, or was it something more? I don’t know, but we are indeed walking down the path of life together. And we still hold hands, at every opportunity.